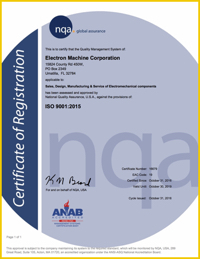 The Electron Machine Corporation is proud to announce that the MPR E-Scan (IS) has been deemed RoHS compliant and has earned the designated CE mark. Senninger Irrigation, a business that has its headquarters in Clermont, has become a leading manufacturer and designer of patented irrigation products, Lake County’s Economic Development and Tourism Department likes to point out. Another is Electron Machine Corporation, which has been operating in Umatilla since 1946 and created the first in-line process refractometer more than 50 years ago, back when orange juice was first concentrated. Their refractometers are used in the pulp and paper, food, and chemical processing industries. In 2013, they were awarded the Governor’s Export Excellence Award.